This website was established in May 2010 and has developed continuously since then. Our aim is to share information held in our museum collection and archive with a wider audience, encourage further research into the history of the industry, and provide a forum for the exchange of knowledge. Although new content is added on a weekly basis, much of the information presented remains incomplete and doubtless contains errors, omissions or is based on false assumptions. We would be delighted to hear from anyone spotting inaccuracies in these pages or able to fill gaps in our knowledge. We would also greatly welcome offers of volunteer assistance in the continuing development of this site, and associated programmes of research. 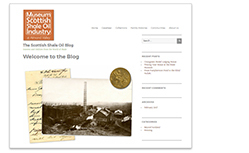 Our Facebook page records the everyday progress of the project, and explores some oddities of shale history. Get the latest news and twitterings on our Twitter page. Thanks to a £50,000 grant from the Recognition Fund administered by Museum Galleries Scotland, work is now underway to create a new platform for this website. This will be fully responsive for use on all devices, database driven to improve performance, and feature map and image based interfaces for easy browsing. The substantial task of creating a new database and page templates, then transfering all data, should be completed soon. The Scottish shale oil industry has a remarkable and important history. Bathgate Chemical Works, established in 1851, was perhaps the first site in the world where mineral oils were processed on an industrial scale. From this blossomed an extensive oil industry that competed successfully against cheaper imported petroleum for many years, and continued in operation until 1962. Such fierce competition bred innovation, progress, and a body of Scots know-how that contributed greatly towards the development of the oil industry throughout the world. This website is being developed to celebrate, exchange knowledge, and encourage research into this special heritage. We hope that the resource will be of particular value to those researching family histories. A database of surviving company documents. Descriptions of working life in the industry. Covering all parts of Scotland. Its history, technology and geology. Information files on each oil company. Catalogue of objects and archives held here and elsewhere. The Scottish shale oil industry collection. Company records now held by our museum. Other museum collections, surveyed 2009. Local images plotted on maps. Archive publications as digital books. Transcripts of interviews conducted 1983-90. Extracts from newspapers and magazines. Become a Shale Oil Explorer. Presentations on the shale oil story. Almond Valley is a family-friendly museum established in 1990 to preserve and interpret the history and environment of West Lothian. It also continues the work of an oil museum research project which, since 1983, had collected objects and archives associated with the shale industry. Download our collections development policy. Much of the collection is now displayed in The Scottish Shale Oil Museum; one of a range of educational and leisure facilities at Almond Valley, close to Livingston, West Lothian. For further information on a great day out at Almond Valley visit our main web site. We are a member of Industrial Museums Scotland and Oil Museums in Europe. We've just added a fabulous book called Bygone Days by Daniel Rankin Stueart, which details the life of this oil industry chemist. Interestingly, it also includes the First World War letters sent home from the front by his son. One of our fabulous volunteers has just transcribed a book detailing the quality of candles. It also contains information about a worker attempting to get compensation after an injury. Our volunteers continue to churn out transcribed documents. Have a look at this minute book, from Scottish Oils Ltd, this minute book from the Dalmeny Oil Co., and this lease book from James Ross & Co.
Dr Alexander Scott's investigation into occupational dermatoses, and cancer, amongst paraffin workers. Our new exhibition has been co-curated with our volunteers who each selected an object from our collection that spoke to them and shared their personal stories behind their choices. Storytelling allows us to draw links between the past, present and future and bring to life the human presence behind any object. This exhibition will be on display in the museum or you can explore it online here.